On Wednesday morning, after hopping out of the shower, I banged my foot on my bedroom doorway. It made quite an impact, and has been hurting ever since. I saw the doctor yesterday, and he says there’s a probable fracture in my little toe which will take a couple of weeks at least to fully heal. It’s certainly got a handsome bruise, and every time I try and walk on it, I get a painful reminder about how vital the little toe is to the foot. Thankfully I’ve been able to work from home for a couple of days. 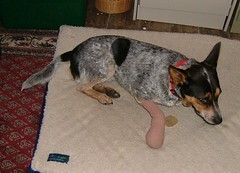 Fortunately unlike Maisie, pictured here in 2005, it’s unlikely the toe will need to be amputated. But the lesson here is that it really pays to look where you’re going. Sorry to hear of your ‘incident’. Hope you are feeling much more comfortable very soon. That happened to me in December (or maybe January?). It hurt for about two months! I could wear only sandals. I hope yours heals fast. Ouch! Hope it gets better soon. I *bet* you swore when you did it. I think it’s impossible not to swear when you stub your toe. Even the pope would do it, I reckon. I get bruised all the time. A symptom of being tall and clumsy I suppose. Here’s hoping your little toe won’t get fooled again. The toe’s improving. At least now I can walk on it. Stuartt, that one showed up on Garfield Minus Garfield. The natural therapist in me can’t help herself. Buy yourself a jar of “comfrey” from the Great Earth Healthfood shop nr corner of collins and elizabeth st in the city, nr cnr lonsdale and swanston in swanston st, or elizabeth & lonsdale in elizabeth st. These are discount health food shops but they have naturopath or naturopathy students on staff so they know what they’re talking about. Another name for Comfrey is “knit bone” which gives you an idea of what it used to be used for. Another thing you might want to look into is Arnica, which is excellent for soft tissue damage and bruising. Good luck with it, anyway. When you’re at home in front of the teev, stick an icepack on it a using a laccy band and elevate it.